June 18/19th 2009. The was the most spectacular NLC display I have ever seen in my life, I hope from reading the Noctilucent Cloud article that new NLC observers will understand the importance of the time of night and position of the Sun which defines the typical NLC window periods during each display, which are after sunset and before dawn, however the lesson here is that during the middle of the night, when the Sun is low, NLCs can produce scenes that are simply unbelievable. This is why any passionate NLC observer should check the sky on a regular basis all through the night for these exceptional moments. The entire display was visible from 23.30-03.30 BST, peaked at type 5 brightness and was 40 degrees (80 full Moon diameters) high and extended from the NW to NE sky sectors. The display first appeared during evening twilight and as always I was out watching and taking images. This is back in a field near Maghera which was lit by the glow of street lights behind me, looking N and NW. On a normal NLC night this would have been a gorgeous sight on it's own, I suspected from its visual profile that it could turn spectacular later, if only I knew what was in store a few hours into the future!. It was already type 5 brightness with vivid pearly white and blue colours showing off, this was probably +50 degrees high at it's tallest point and was spreading out quickly in azimuth. Even at this stage of the evening exceptional structure was evident in the form of bands, lacunosus holes, waves/herringbone (sometimes called billows) and large scale whirls. The sky had turned completely overcast and very dark. I was back at home having a nice mug of tea while chatting with Astronomer John C. McConnell over the phone, I kept looking out the windows on a regular basis for breaks but none were evident. It had been a while since I had seen the display now and knowing full well that it would get better as the night went on I was eager to see it again. While chatting and sipping tea I walked out to my backgarden for one last look at the sky, I rounded the corner of my house and glanced to the N and NW where a large clearance had suddenly appeared, what I saw took my breath away. I was completely blown away by the spectacle in the sky, I just couldn't believe what I was seeing, it looked like intense Rococo-style alien writing scribed across the sky, it could have been found within the tomb of an ancient Egyptian Pyramid. I went into a panic, I began making strange remarks over the Phone to John saying...''Oh my God, oh my God'' over and over again, ''John, you won't believe the NLC display I'm looking at rite now, it's the best I have ever seen in my life'', I recalled thinking that of all the images I have seen on the internet during my years of NLC research, not one of them looked like what I was seeing now. This was a major event and I needed to get out now. I just said ''John, I'm away...'', and the phone was back in its cradle. I grabbed the camera and tripod and ran out of my area, across a country road, and jumped into a field I had used before where the lights illuminated the grass. I was in a complete panic with adrenaline pumping, my hands were actually shaking as I tried to clip the camera onto the tripod and work out in my head what settings I needed. Time was of the essence, NLCs change by the min plus more cloud was building from the W and moving in so I needed to act now. There was no way I was going to let this display slip past me without getting good images. The above image is the first of the sequence, these are ISO200, aperture stopped down a little with exposures in the 4-6.5 sec range and various focal lengths. This was unbelievable!. Despite this being the darkest time of the night with the lowest Sun elevation I was astounded by just how much this display glowed with outstanding brilliance. The top part of the display was type 4 with the middle and bottom sections type 5. In other words, it was an elite example of a shadow-casting display at the very top of the scale. I could actually see the ground glowing up by it's light, and the small patches of Trop cloud which drifted lazily by where also reflecting white and blue light from it. The colours were extreme, with electric blue, subtle purple, white, silver, green, a hint of yellow, and the most remarkable deep gold colour, all these together glowing in the sky at the same time was simply stupendous. I had often fantasized about seeing a rare display like this and on this night my dreams had come true. Look at the structure!! !, what's more, the naked eye view was even better than what these images show and that's saying something. I was beside myself with happiness and amazement as I stood out in this orange field during the early hours of the morning staring in wide eyed disbelief at this absolutely spectacular NLC display. I felt like I was part of a dream were time seemed to stand still, with the exception of that orange light in the house below there was no sign of life in that direction, not even the sound of a distant car on the road, it was just me and the NLCs, it was a magical experience which I shall never forget. The grass was short and dry, it was calm with not even a breeze, and the countryside around me was silent. The dark outline of Bat darting in front of my face broke my trance and I went back to reality once more. The majority of stars were washed from the sky from the phenomenal intensity of this display which I could see vividly with phenomenal detail on my camera's LCD screen. 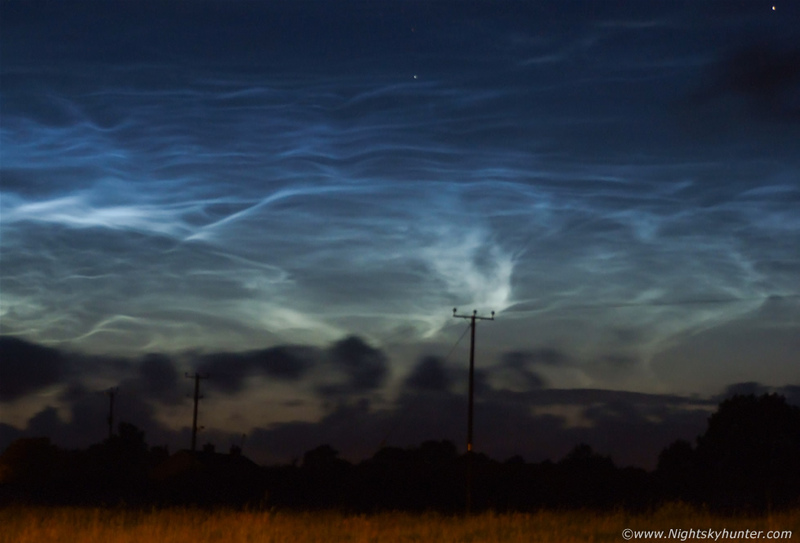 Just about every type of NLC structure possible is present here. Thanks to its incredible complexity, which cast shadows onto other sectors of the NLC display, the entire scene looked 3 dimensional with eye-catching depth. Among all the patterns my favourite kind of all prevails, the large and small scale whirls/twists. A complex NLC display is always at its most spectacular when you see it side-on from an oblique angle, if you wait until it creeps overhead then your viewing angle has naturally changed so you are looking at the NLCs from underneath like the under side of a tenuous blanket. In my opinion it's the oblique displays which are truly the most visually spectacular, and this one is the ultimate example. Blue on top, white at centre, and the gold colour beginning to register on camera at the bottom like sand on a beach. On display are sharp edged IIb bands, shadows, small scale whirls, large scale whirls, loops, pits, lacunous holes, well defined waves/billows with kinks, also knots, billows crossing a band, veil, and even unknown structure which I have never seen before. This looked extremely alien to me, the motion of the NLCs were absolutely incredible, this thing actually moved fast!, the ENTIRE display was moving, not as a single entity but different areas moving independently from one another. The centre regions where twisting in a circular motion like a garden sprinkler while other sections moved horizontal or vertical as they all interacted like a living breathing system. Not a single star was visible through this. I knew I was looking at the display of a life time. I thought about any late night drivers navigating across the quiet roads through N. Ireland this night, they would have seen this without a doubt and wondered what was going on in the sky, I'm sure late night truck drivers were chatting over the CBs. There's serious gravity wave motion taking place through the Mesopshere here to create those forms. Mother Nature is absolutely incredible. The detail in this display is beyond me to describe, I have never seen anything like it before in my life and I do wonder if I will see anything like it again. A display of this standard is an extremely rare event, so for this reason and the fact that no one else got a show like this I believe the images from this night are unique in the world, and that's with complete modesty. My attention was drawn to the wave-like motions to the R and the blue feature which looks like a bubble which has just popped in a network of electric blue suds. You would be forgiven for thinking there was intelligence behind this design, and perhaps there was. I later found out that someone else had posted one of these images on a religious forum as proof of God. I don't like to comment on such things however it was nice of them to use it in that context which I don't mind at all. I'm not a religious person myself however when I was watching this glowing moving matrix of brilliance I did feel like I was watching the handy work of a creator, perhaps God is a painter!. ''Hope there's still space for some more NLCs! As Martin Mckenna says - it was a display of a lifetime. Shadows indeed! It was actually the first time I'd ever seen these but it was better than any photos I've seen up till now. Incredibly bright, and stunningly detailed'', * All images are available for sale in the form of photo prints, canvas or digital files for licensing, if you are interested in a purchase simply drop me an email.